The ChemSoft Labelling module is designed to facilitate the creation and printing of high quality supply and transport labels. 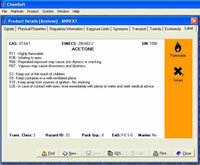 ChemLabel offers a wealth of advanced features with an easy-to-use operator interface. ChemLabel uses the unique text attributes of fit-to-box. These features modify text size within user-defined limits to optimise text in the space available. This is an essential tool for multi-lingual labelling. ChemSoft Labelling is fully integrated into the ChemSoft suite of applications - soon as a substance or preparation has been created in ChemSoft Classification, the compliant label for that product is available to print eliminating the need to type the information again. Using the graphical design screen, label layout is both rapid and intuitive. Draw text, graphics, barcodes, boxes, lines and ellipses. Easy to use tools for modifying all aspects of the layout plus simple connection to external databases. Format labels so that printed output is always perfect, regardless of supplied data. Customise printing with your own prompts to guide unfamiliar operators. 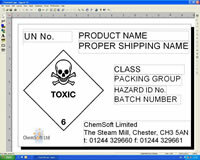 ChemLabel is a true WYSIWYG (what you see it what you get) system allowing label design to be a simple process of taking objects on the label and dragging and dropping them into position. Prevent unauthorised changes to label layouts with the separate print program. A familiar Explorer-style interface, with thumbnail preview, makes label selection easy for inexperienced operators. Formatting applied during label design ensures that printed data is correct every time. The print program has no facilities for changing label layouts so they always print exactly as you intended. Pre-defined fields may be set to allow print-only operators to enter data such as batch numbers, expiry dates, pack sizes etc at print time. ChemSoft labelling is the choice regardless of printer technology - Thermal Transfer, Laser, Ink Jet, Matrix… choose the printer that matches your requirements and operating environment. ChemSoft Labelling provides access to all the windows fonts, a wide choice of colours and the facility to import many different graphics formats. Additional customised fonts for labelling are also available. Label production often requires formatting of input data – ChemSoft labelling has comprehensive facilities for handling data. Keyboard Data Entry, Option Lists, Incrementing Numbers and Serial Numbering. Where more complicated processing is required, the Macro scripts feature provides all that a professional user needs for custom data manipulation. A simple label print screen ensures that label printing is straight-forward, even in the most demanding situation. Depending on your requirements, labels can be queued prior to printing, queues can be saved and edited, a print preview can be displayed or operators can be warned when differed label stationery is required. A ‘text’ only preview option can display operator instructions as well as label data. A control database option is available to automatically select print job, quality and printer when a particular product or item is selected for printing. We guarantee you'll be printing as quickly as possible using the predefined standard label layouts. Use them as supplied or modify them for your own requirements. A Print Only and Developer Print Engine versions of the software are also available.